CASA’S 2nd annual Changing Lives with Art, Wine and Cuisine will be at 5:30 p.m. at the Athelstan Club, 170 St. Francis St. There will be a silent auction of artwork donated by local artists. Wine and hors d’oeuvres will be served. Tickets cost $40 per person and $75 per couple, and may be purchased by calling Elizabeth Walter at 251-574-5277 or visiting the Mobile County CASA Facebook page. Alabama Coastal Foundation (ACF) will hold the 5th annual Cocktails for the Coast to celebrate the importance of our shared coastal heritage and the dedicated individuals who work tirelessly to preserve our rich coastal resources. This event will take place from 6-8 p.m. at the Five Rivers Delta Resource Center located at 30945 Five Rivers Blvd. in Spanish Fort. All proceeds benefit the ACF’s habitat restoration and environmental education programs. Admission is $50 and can be purchased via credit card or electronic checking through ACF’s secure website, www.joinACF.org or by phone 251-990-6002. Vino and Values is a fun and lively evening where women come together in the spirit of faith to enjoy wine, good food, good friends and a great speaker. This year’s Vino and Values is scheduled for 6 p.m. at St. Mary’s Sister of Mercy Building (106 Providence St.) with speaker, blogger and author Leah Libresco. She will coach women on how to conduct their arguments so that they and their opponent can notice if they are wrong quickly, admit defeat cheerfully and keep pursuing truth together. Wine and appetizers are provided. The suggested donation is $10. For more information, log on to www.facebook/vinoandvalues or contact the parish office at 251-432-8678, ext. 1. United Cerebral Palsy of Mobile will host the inaugural Christmas Nights of Lights 5K at Hank Aaron Stadium at 6 p.m. 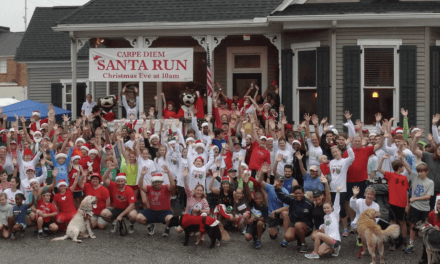 This will be a unique event along the Gulf Coast, with runners and families able to run or walk through the incredibly popular Nights of Lights display at Hank Aaron Stadium. For more information and to register, visit eventbrite.com or ucpmobile.org. Dr. Bill Barrick, executive director of Bellingrath Gardens and Home, will be the guest speaker at the lunch forum at Government Street Presbyterian Church, 300 Government St. He will discuss the surprises in store for the 20th anniversary of Magic Christmas in Lights, which opens the day after Thanksgiving, Nov. 27. Lunch costs $10 and is served at noon. The forum begins at 12:30 p.m. There is no charge. For more information, call the church office at 251-432-1749. Fairhope’s market features local farmers, bakers, fresh produce, fresh-cut flowers, plants, baked goods and more. Fairhope Public Library will have storytime and activities at 4 p.m. For more information, call 251-929-1466. Fairhope Public Library is at 501 Fairhope Ave. The 30th annual Alabama Pecan Festival opens Friday, Nov. 6, at 4 p.m. for a three-day run at Tillman’s Corner Community Center, 5055 Carol Plantation Road, with many of the activities taking place at the adjoining W.C. Griggs Elementary School. Featuring pecans, pecan pies and treats, satsumas, honey and syrup, midway rides, a petting zoo, a writers’ and publishers’ venue, model railroads, live music and more! 16-year-old Jillian Alyse Poiroux will be crowned festival queen! , For more information, call Billy Bolton, executive director, at 251-401-5555 or visit www.alabamapecanfestival.com. It’s time for the fair! The Grounds will host the 61st annual Greater Gulf State Fair now through Nov. 8. This year’s fair features a new theme, “Lions, Tigers, The Fair, Oh My!” that aims to host the best things about “The Wizard of Oz” under one roof, as well as more than 30 adult rides, 30 kid rides and a must-see entertainment lineup! For more information, call 251-344-4573 or visit thegroundsmobile.com. “Strung Together,” a film by Jon Miller about cigar-box guitars, their makers and the musicians who play them premieres at the Crescent Theater Sunday, Nov. 8, at 8 p.m. Tickets are $10 and include a short Q-and-A after the movie. Beforehand, Serda’s Coffee Company on Royal Street will host a free cigar-box guitar open mic from 5:30-7:30 p.m. For more information, visit www.strungtogethermovie.com. Join All Saints Episcopal Church for its 11th annual Bayou Bash. Tickets are $30 and include food, music by The Deluxe Trio, live and silent auction items and plenty of fun! All proceeds directly benefit All Saints’ outreach ministries. All Saints is located at 151 S. Ann St. For more information, call 251-438-2492. The Eastern Shore Art Center returns with new art and music. Come check out the new exhibits, live pottery demonstrations while enjoying refreshments and live entertainment by The Sound Carpenters. The art walk begins at 6 p.m. at the Eastern Shore Art Center, 401 Oak St., Fairhope. For more information, contact Adrienne at 251-928-2228, ext. 103. The Alzheimer’s Association is inviting Mobile-area residents to unite in a movement to reclaim the future for millions by participating in the Alzheimer’s Association Walk to End Alzheimer’s. The walk will take place at the Mobile Museum of Art in Langan Park. In addition to the walk, there will be music, face painting and more. To start or join a team today, visit the Alzheimer’s Association, alz.org/walk. To learn more about the disease and available resources, call the toll-free Alzheimer’s Association 24/7 Helpline at 1-800-272-3900. It’s time for the 2nd annual We-Mo Chili Cook-Off. The cook-off will be held 11 a.m. to 1:30 p.m. at Providence Presbyterian Church, 2320 Schillinger Road S. $5 will get you a taste of every chili in the competition; children 8-years-old and and under are free! Drinks and desserts will also be sold, so we would appreciate donations of these items as well as paper products. Proceeds from the event will go to McKemie Place Homeless Shelter. For more information, contact Providence Presbyterian Church at 251-633-9701 or office@providence-pc.org. The city of Fairhope will honor its military veterans with a Veterans Day Parade starting at 10 a.m. The parade will begin and end at the Fairhope Civic Center. Leading the parade will be Fairhope’s 2015 Veteran of the Year. A light breakfast featuring the Center Stage Show Choir will be held before the parade begins, at 8:30 a.m. in the civic center lobby for all veterans and parade participants. For more information, call Paige Turberville at 251-929-1466. Get ready for the 3rd annual Stockton Sawmill Days at Baldwin County Bicentennial Park, 51233 State Highway 225. Enjoy a professional lumberjack show and logging with draft animals, folk art, living history demonstrations, and outdoor cooking with Johnny Nix. Admission is $10 for adults and $5 for children. The fun begins at 9 a.m. For more information or questions, call 251-937-3738 or visit www.stocktonsawmilldays.org. Local author Charlotte March will be at Page & Palette signing her book “Jubal Leatherbury,” a two-part southern family saga. Both Book 1 and Book 2 will be available to purchase. The signing will begin at 1 p.m. at Page & Palette, 32 S. Section St. in Fairhope. For more information, call 251-928-5295. It’s time for the Wells Fargo Charity Run for the Reese’s Senior Bowl. The Family Fun Festival will begin at 8 a.m. with the start of the 5K, followed at 8:15 by the 10K start. Awards will be presented at 11:30 a.m. To register or for more information, visit the Senior Bowl Office at 151 Dauphin St. or seniorbowl.com. Mum’s the word at Bellingrath Gardens and Home in November, when it’s time for the 52nd annual Fall Outdoor Cascading Chrysanthemums show, the largest outdoor mums display in the nation. The blooms will be at their peak Nov. 7-21. Guests will also see columns of mums and bedded plants along the Great Lawn’s dramatic border in the rich fall colors of red, yellow, bronze, lavender and white. Hours are 8 a.m. to 5 p.m. Admission: $12.50 for adults, $7 for ages 5-12; free to Bellingrath members and ages 4 and younger. For details, check the Mum Watch page on www.bellingrath.org or call 251-973-2217. Join the Eastern Shore Art Center for the perfect holiday shopping for friends and family! All handmade art, crafts and gifts! An artist market will be set up inside the main gallery from 10 a.m. to 3 p.m. Eastern Shore Art Center, 401 Oak St. Fairhope. For more information, contact Adrienne at 251-928-2228, ext. 103. Shop for the freshest crops every Saturday through Nov. 21 at Cathedral Square in downtown Mobile. This time of year is our favorite because you can buy locally grown fresh greens, fall corn, squash, peppers, sweet potatoes, pastas, seafood, sausages, eggs, goat-milk cheese, breads and baked goods and much more. Stay for live music on the green. For more information, call 251-208-1550. Join Our Savior Catholic Church, 1801 Cody Road S., for its 9th annual Merry Mart. Shop among a wide variety of local vendors and crafters! The kids can shop the Santa Shop, hosted by the Youth Group! We’ll also have a special visitor — Santa Claus! Bring your camera or smartphone for some fun pictures. The mart opens at noon. For more information, call 251-402-0575. Mobile Ballet opens its 2015-16 season with Winthrop Corey’s “Snow White” featuring Lauren Woods and Raul Peinado. Shows begin Saturday, Nov 7, at 7:30 p.m. and Sunday, Nov. 8, at 2:30 p.m. at the Mobile Civic Center Theater, 401 Civic Center Drive. Tickets start at just $20 and may be purchased online at www.mobileballet.org or by calling the Mobile Ballet Box Office, 251-342-2241. St. Mary Catholic School PTO brings back the Fall Festival, but this time with an added event, the Mustang Stampede! This 5K Run/Walk begins at 9 a.m. on the St. Mary campus. The Fall Festival begins at noon and features a chili cook-off, fall market, face painting, games and more! Email tsasserpto@stmarymobile.org or call the school office at 251-433-9904 for race, chili cook-off or fall market entry. St. Mary Catholic School is located at 107 N. Lafayette St. in the Old Dauphin Way district of Mobile. Join Our Sisters’ Closet for their 10th annual Purse with Purpose event. Enjoy men modeling purses for the live auction as well as silent auction items. The event begins at 5:30 p.m. at Heron Lakes Country Club, 3851 Government Blvd. Tickets start at $30 and include heavy hors d’oeuvres. All proceeds go to Our Sister’s Closet, which provides women in need with free interview and workplace clothing as well as job preparation. For more information and tickets, visit oursisterscloset.org. The Zonta Club of Mobile will host Lunafest, the fundraising film festival dedicated to promoting awareness about women’s issues, highlighting women filmmakers and bringing women together in their communities. This unique film festival highlights women as leaders in society, illustrated through nine short films by women filmmakers. The event begins at 6 p.m. at the Crescent Theater (208 Dauphin St.) with films shown beginning at 8 p.m. Tickets are $15, available at www.lunafest.org/mobile. The Mobile Baykeeper Young Advisory Council will be hosting Bay Bites III from 5-8 p.m. at Cathedral Square in downtown Mobile. Bay Bites is an opportunity for the community to enjoy cuisine from local food trucks, music by Lee Yankie and craft beer provided by SweetWater Brewing Company. Tickets are $10 in advance or $15 at the door. Admission includes three beer tickets and access to all of the following food trucks: Bacon My Day, Grits and Grub, Von’s, Geaux Boy, Smokin’ Gringos and Chef Will Hughes. Get your tickets and more information at mobilebaykeeper.org. Mobile Museum of Art (MMofA) hosts a quarterly Night Market of artist and artisan wares. Bring a keen eye for detail and become known for the unique gifts you give. Be the envy of your friends with rare, artful home décor. Support your local artists and join the party and shopping fun with great food, drink and live music. The market starts at 5 p.m. at MMoA, 4850 Museum Drive. The state of Alabama is working with the U.S. Army Corps of Engineers to develop a constituent-informed, science-based coastal comprehensive plan to strengthen the economic, environmental and social resilience of coastal Alabama for current and future generations. As part of the development process, the state is seeking input from the public to complete the first phase of the Alabama Coastal Comprehensive Plan (ACCP). The workshop will offer participants an opportunity to speak one-on-one with those working to develop the ACCP, as well as a chance to experience the ACCP’s interactive website. The program will begin at 6 p.m. at the Mobile Marriott, 3101 Airport Blvd. For more information, call 251-380-7944. Farmer’s market is sponsored by Christ United Methodist church every Tuesday through Nov. 24 from 2:30-5 p.m. It features locally grown produce, honey, seafood, baked goods and other homemade items. Located at 6101 Grelot Road (corner of Grelot and Hillcrest). The Fairhope Museum of History hosts Tea for Two each Tuesday afternoon at 2 p.m. Guests enjoy a cup of delicious Baldwin County tea, cookies and a lecture on an interesting aspect of Fairhope history. These very popular afternoon events are sponsored by the Friends of the Museum. For more information on upcoming programs, call the Fairhope Museum of History at 251-929-1471. Mobile celebrates Veterans Day with a host of activities and events including: flag-raising ceremony at the USS Alabama Battleship Memorial Park at 6 a.m.; Veterans Day Parade at 10 a.m. in downtown Mobile; annual luncheon at noon at Fort Whiting; and Freedom Celebration at 3 p.m. and Mobile Pops Concert at 7 p.m., both at Battleship Memorial Park. More information can be found at facebook.com/MobileBayVeterans. More than 250 volunteers from the community have embarked on a massive effort to raise money for veterans by creating more than 3,000 ceramic poppies at the Eastern Shore Art Center (ESAC). The poppies will be placed on the bluff in Fairhope around the Veterans Memorial on Nov. 10 and remain there until the conclusion of the Veterans Day sunset ceremony on Nov.11 at 4:45 p.m. Poppies are available to pre-purchase online at www.esartcenter.com and at the Eastern Shore Art Center, $20 for one, $50 for three. Poppies can be picked up on the bluff or at ESAC after the ceremony on Nov.11. Join the ladies of Mobile Junior League for their annual Christmas Jubilee. To kick off the shopping market, there will be a review gala and a chance to shop while enjoying delicious food, beer and wine, entertainment and a silent auction, as well as a cooking demo by renowned Chef John Besh. You don’t want to miss it. For tickets and more information, visit juniorleaguemobile.org. This year’s Christmas Jubilee will be held at the Mobile Convention Center, 1 S. Water St. In recognition of Veterans Day, historic Blakeley State Park offers a special multifaceted event highlighted by park-ranger-narrated tours of the Civil War battlefield followed by lunch and lecture by noted author Frye Gaillard. The program begins at 9:30 a.m., ending with lunch catered by Chick-Fil-A. Reservations are required, as the number of attendees is limited. Ticket cost including both guided tours and Gaillard’s lecture and lunch is $20 for adults/$15 for children 12 and under. To make reservations or for more information, call 251-626-5581 or email blakeleypark@aol.com. Blakeley Park is located on State Highway 225 about 4.5 miles north of its intersection with U.S. 31 in Spanish Fort.